I don’t know about you, but I’m guessing you are probably a lot like me. Once this time of year rolls around we imagine ourselves in the kitchen each day, whipping up cakes, cookies, and all manner of holiday confections for our loved ones, neighbors, and friends. In my imagination, I’m always wearing a big old smile as my family looks on adoringly in appreciation of how I do all of these wonderful things to make this time of year even more memorable. 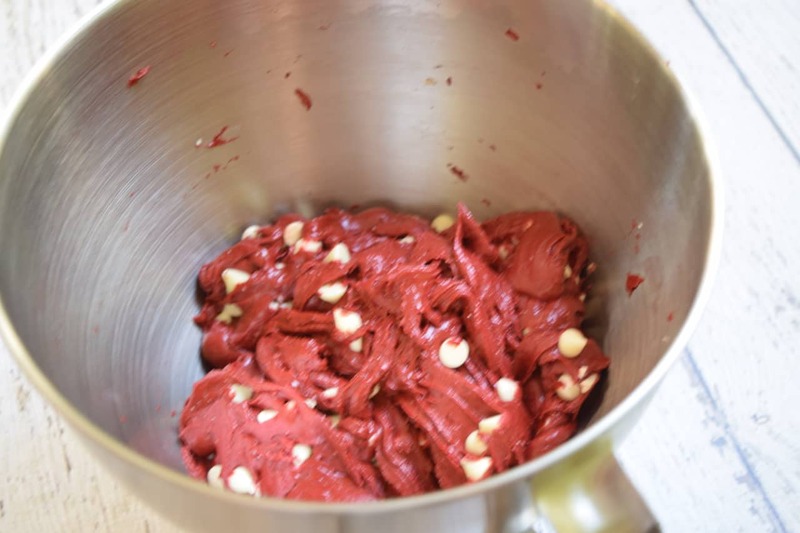 And that is where these cookies come in 🙂 No fuss, no muss, and you end up with big, beautiful, perfectly shaped chewy red velvet cookies studded with white chocolate – with just one dirty bowl, 5 minutes, and a couple of baking sheets. And THAT makes my days more Merry! Pay attention and don’t blink because these are made so fast you’re liable to miss it if ya do! 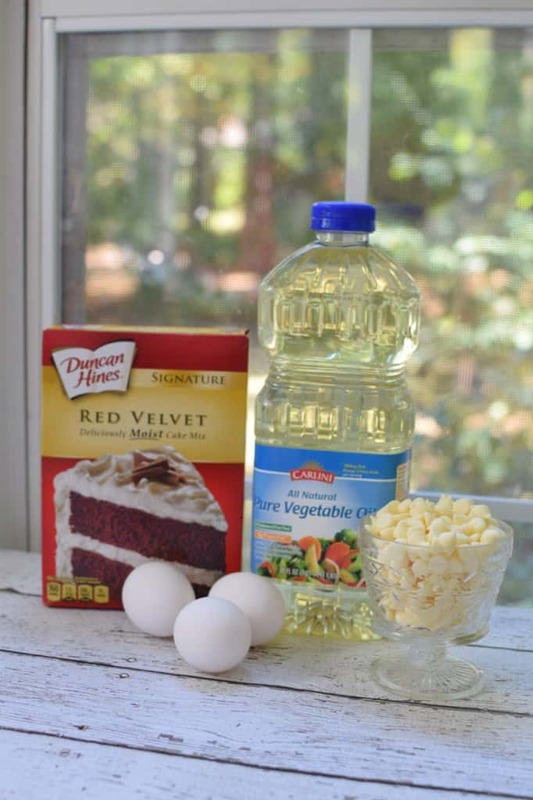 You’ll need: A box of Red Velvet Cake Mix*, 2 Eggs*, White Chocolate Chips, and Vegetable Oil. *This recipe works with any cake mix. I especially like chocolate and red velvet. *There are three eggs pictured but the recipe only calls for two. Maybe I did that as a test to see if you were paying attention. Remember that three legged chicken I cooked once? Yes, in my wisdom I am sure I did this as a test to see who was awake at the computer today. Either that or I just happened to grab three eggs and that is what ended up in the photograph. I have a lot going on in this old brain of mine. Things happen. 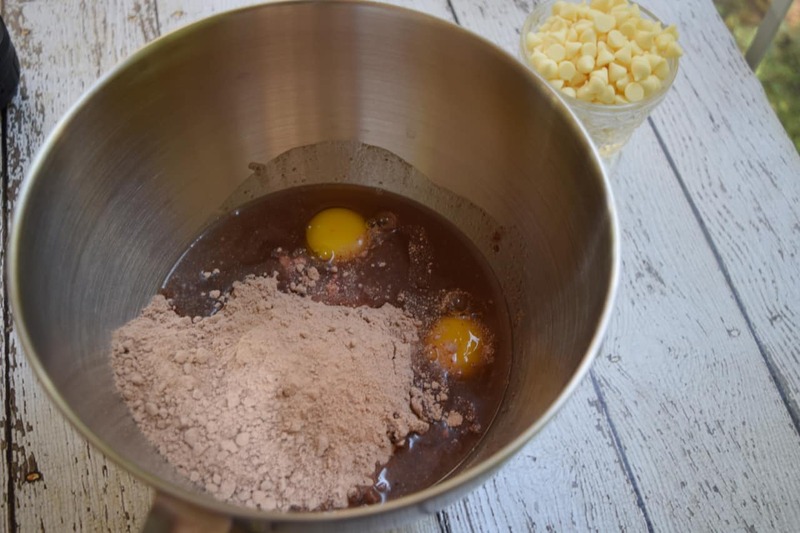 Place cake mix, eggs, and oil in a mixing bowl. Beat it like it was responsible for putting the alphabet in math. For a Future Teachers of America fund raiser, Denzell sold subs and pizzas. Pizzas were $5 and Subs were $3. He sold 11 more subs than pizzas and earned a total of $223. Write and solve a system of equations to represent this situation and tell how many pizzas and subs he sold. I told my son that the alphabet being in math is further evidence that we live in a fallen world. Scoop your dough out into slightly smaller than golfball sized balls onto ungreased baking sheets. Bake these at 350 for 10-12 minutes, or until very lightly browned on the bottom edges. 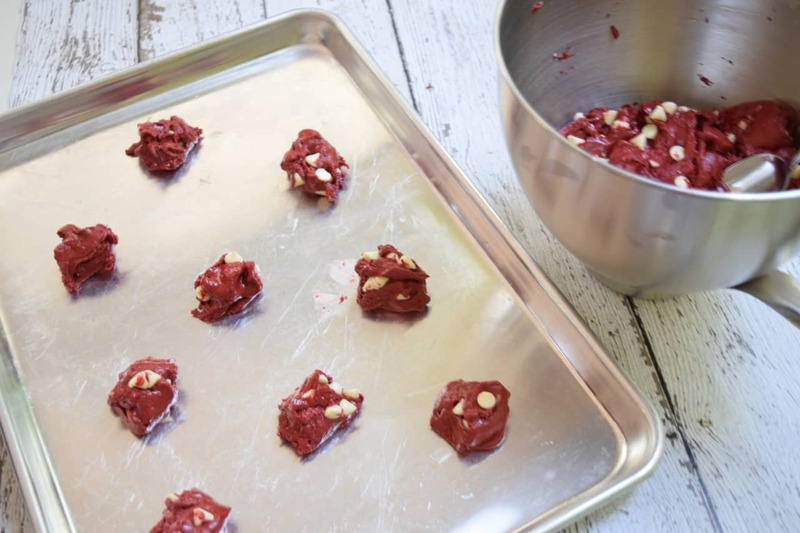 Let them cool for a few minutes before removing them from the baking sheets. In a mixing bowl combine cake mix, eggs, and oil. Mix with an electric mixer until well blended. Stir in the white chocolate morsels. Spoon cookies a little smaller than golf ball size onto ungreased cookie sheets. Bake at 350 for 10-12 minutes or until very lightly browned on the edges. Allow to cool completely before removing from cookie sheet. Yes, a math explanation I can understand and agree with! Just keep those tick marks. That’s what I do. And why I don’t help my son with math homework — that’s his math whiz dad’s job. Plus, cookies as a math reward! Can’t wait to try these. These cookies look tasty. The REAL treat is that this is the funniest recipe I have ever read. I laughed out loud – and agreed with every word!! Thanks for a two-fer. A great recipe and a great read. Love easy recipes like this one and agree 100% with your comments on math problems. It makes cleanup easier but you don’t *have* to 🙂 If I had it in abundance I’d probably use it. I have been following you for several years now. I just love your recipes. My granddaughter loves to cook and bake with her Nana. Thank you for having such simple easy recipes that my granddaughter can basically fix herself. I usually don’t like to make cookies, but this recipe is so easy, with so few ingredients, I am going to give this one a try this Thanksgiving. Thanks, Christy, another time saving recipe. How much vegetable oil Please? I’m old & so are my eyes!! :) Thank you!! I’ve been using basically this same recipe for 20+ years to make chocolate chip cookies, but i use yellow cake mix and chocolate chips (instead of red velvet and white chocolate chips)… i use a stick of melted butter, so that’s, what, 4oz? i’ve made it with two eggs, one egg, and once i forgot to put an egg in altogether and even those turned out ok, a little crumbly but ok.
Hey! you should be able to hit the print button to the right of the recipe title at the bottom of the post and print it out – it will be larger then 🙂 It is 1/2 of a cup. thanks! Sandy, You’re SO Right! Best Laugh of the WEEK for me, & so very True about letters & math!! Thanks, Christy, for making my day full of joy, as usual, with your story. There’s so much more I Could say about math, but for the sake of brevity, I’ll just say that I really connected with that story! From a Southerner Fighting Polar Vortex’s in Minnesota!! Your posts make me smile, think, and often pray. I love the math post cause since eighth grade I have held the same opinion….letters and numbers don’t want to live together! Thank you for all your inspiration and making me a better cook. We are some Red Velvet Cake folks here in Mobile, Alabama. Looking forward to trying these. I have been reading your blog for 3 years and my grandson, Parker, refers to you as Ms. Christy. He loves the books you read. I made the cookies and they are delicious, but, I didn’t have white chocolate chips just milk chocolate. In the mixing bowl the chips were pretty and shiny oh but when the cookies came out of the oven they were not pretty at all. So, if you have boys and don’t want to hear comments like “eeww did you get these out of the pasture” I implore you to use white chocolate chips like the recipe calls for. They did eat them though and liked them. Thanks for a great recipe Christy! Made me smile! 🙂 My boys, (31 & 25) would do the exact same thing. Red velvet sounds so yummy! Question…are the cookies soft? I made some spice cookies this week, and used a spice cake mix, 1/2 cup oil, 2 eggs and 1 cup of diced apples. I love soft cookies, but by day two…they were too soft! Thanks for all of your great recipes!!! I have made some like these for years using a strawberry cake mix. I can’t find cherry cake mix anymore. Same ingredients as your recipe except, I cut cherries into quarters and place one quarter on top before baking. 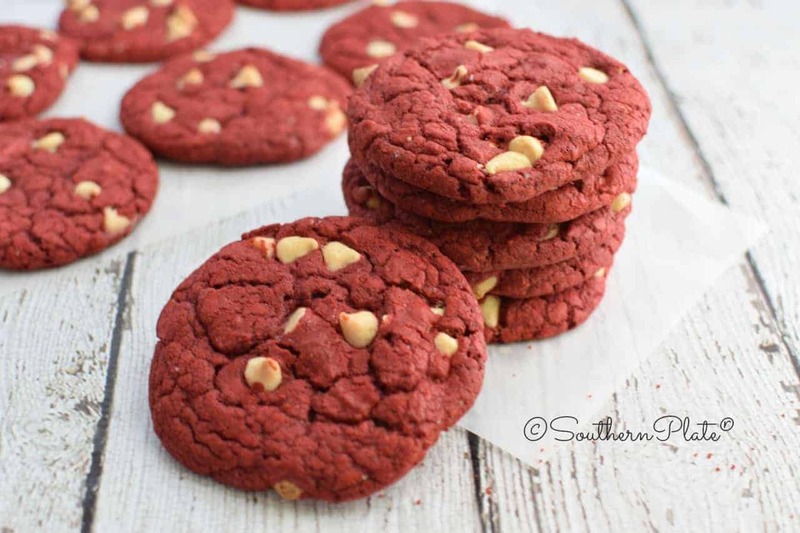 Everyone thinks they are cherry cookies. Never tried with the red velvet, but now is the time. Thanks for posting. Christy I too love cake mix cookies. Always soft and yummy! I feel your pain with Algebra. I once told an instructor that letters were meant for making words and reading and numbers were meant for doing math. That I believed with all my heart that God never meant for them to be combined in order to drive people crazy. These look so yummy. Gonna have to try them soon. I SOOOOO agree with you on this so called algebra mess. I’m dealing with the same thing with my 9th grade daughter. I don’t know where they get this crazy stuff from. Christy, I’m not really into baking, so these cookies look great for me. The only baking I do is with boxed mixes, so thanks for an easy cookie recipe I will have to try soon. Keep’em coming!! I am loving these EASY wonderful recipes for Christmas cooking!! Thanks for this recipe Christy. My boyfriend needed to bring 40 cookies to a office meeting. Of course he knows I get all your emails with recipes so he asked me to make one of your cookie recipes. This one looked perfect since it is Christmas time. Oh Wow, I am so honored!! I hope every one loves the cookies and you have a very Merry Christmas!! Your cookies were a hit at the office meeting Christy! My boyfriend just texted me to tell me everyone loved them! He said they were gone in a few minutes. Thanks so much again for the help. I cannot wait till your next cookbook comes out. Merry Christmas to you! Oh my goodness, I am so glad they were a hit!!!! I made these for the first time today,I had tried the recipe on the Duncan Hines box last year and it was a disaster…This year I found this much easier recipe though your site…They are Fantastic!!!! I just finished making my 3rd batch…Thank You My Christmas tins no doubt will be a Hit !!!!! God Bless and Merry Christmas to You and Yours. I forgot to add, this dough is so easy to work with, next batch I’m trying it in a cookie press. Great idea Donna. I have never tried it, please let me know how it works out!! I hated math at that level, oh didn’t like it in lower levels but could manage it. I failed grade 9 because I put down the answers and no work, I did it all in my head but couldn’t tell the teachers how. I still don’t know . I do know the next year the teacher actually made up an equation he had to work to find an answer, I had it written dow within a minute, he knew I wasn’t cheating so he marked my papers himself, I could make the equations, but not the work steps to get the answer, my brain just wouldn’t do all that when it knew the answer. That having been said, the cookies look great. By the way they lied about needing that abc stuff later in the work force, I needed adding, subtracting and multiplication skills in every job, and in my home life, learn accounting instead, better return on the work, as far as math goes, kids need to learn budgeting, checkbook balancing, and how to deal withrent, mortgages etc, not how to play with letters and numbers. I like the way you think Eva!! Years ago,I got a “C” in Algebra for the same reason. Al answers correct;no work to show how…. I made these to take home for Thanksgiving, and they were a huge hit! This recipe made 3 dozen small to medium sized cookies for me and I used Andes come de me the chips instead, turned out awesome! 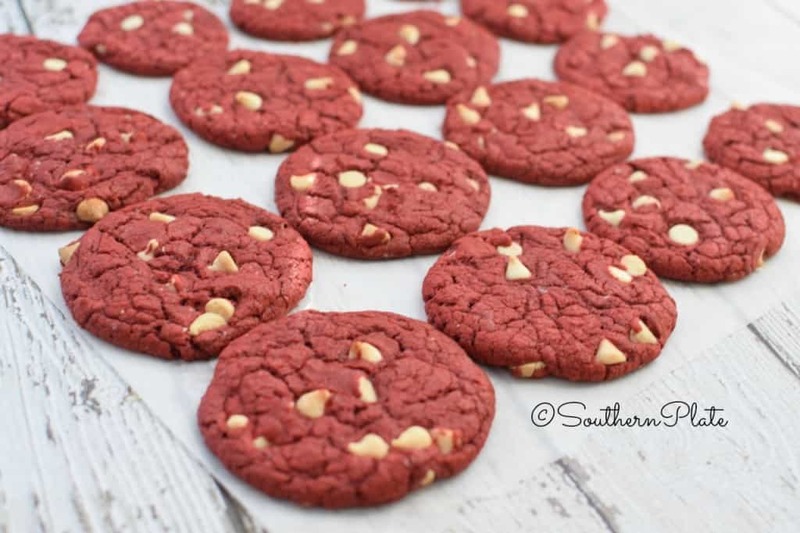 I just printed the Red Velvet cookie recipe. I am not fond of white morsels. Could I add nuts or chocolate chips instead? You sure can, of course it will be an experiment and I don’t think they would taste the same but I would love to hear how it turns out. The Christmas season may not be long enough, but I have a feeling that your Christmas spirit lasts all year. Thank you for sharing your talent and spirit with the world!